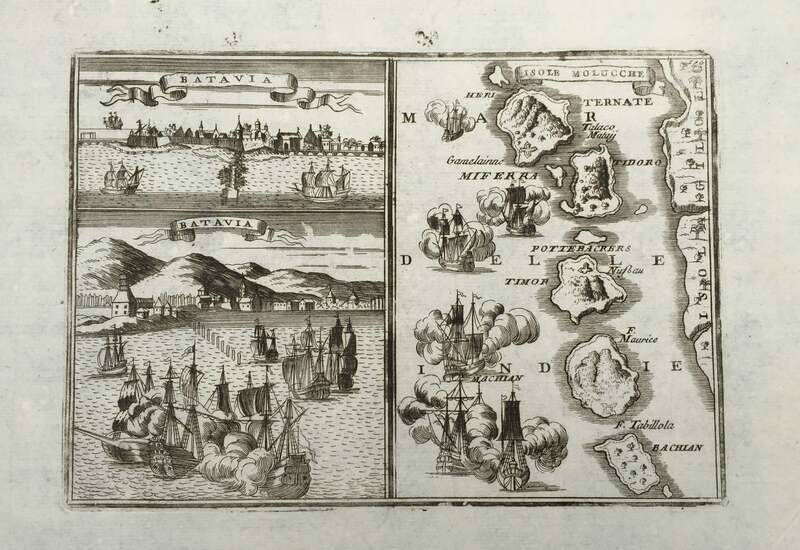 An attractive late 18th century black and white miniature map of the clove producing islands of North Molucca with two views of Batavia to the left of the map; one view a close-up of the Batavia waterfront with the the fort in the foreground and the other a views from the Raods to towards the Bogor mountains by the French engineer and cartographer Allain Manesson Mallet (1630-1706), who compiled a five-volume work entitled Description de l’univers that was published in Paris by Denys Thierry in 1683. This map appeared in the second volume that relates to Asia. Another small map entitled Isles de Sonde vers L’Occident covering the western part of the archipelago also appears in the second volume. Very good condition; measures 125 x 180 mm.